There is a lot of poker to be played this summer! Deltin Poker Tournament – India’s biggest offline poker series is back which boasts a mammoth 1 Crore guaranteed prize pool. Here is where you can find all you need to know about participating in DPT July 2018. Powered by Adda52, Deltin Poker tournament is returning to Deltin Royale – India’s largest and luxurious offshore cruise ship. The highly anticipated poker event will be held from 26th to 29th July 2018 on the casino vessel which is anchored on the Mandovi river in Goa. Players can qualify for the DPT tournaments by participating in online satellites hosted by Adda52. The satellites have already begun and will end on 25th July. Super Satellite Winner will get 4 Nights accommodation or a reimbursement of up to Rs. 10,000. The July edition of DPT features popular categories of poker tournaments including High Roller and Bounty formats of NLH which are surely going to attract some of the best poker talents in India. The high-end High Roller tournament will be played on 27th and 28th July with Rs. 65,000 buy-in. The Rs. 15000 bounty will be played on 29th July and the players who register for the bounty on Adda52, will get assured Rs. 2200 instant bonus. All players participating in High Roller and Main Event will get “Stay and Play Package” which includes accommodation and airport transfers. If you are looking to play unlimited poker this summer and win fabulous cash rewards, there is no better place than Deltin Royale which is all set to host this spectacular poker festival. This is 2018’s last DPT edition so don’t miss out this wonderful opportunity to exhibit your talent and knowledge on the tables and win your share from the gigantic prize pool worth Rs. 1 Crore. 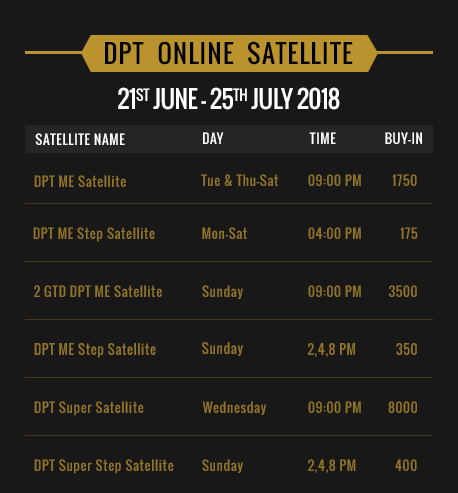 Log in to register for DPT online satellites now. Players need to register for DPT Events at the venue with their Adda52 accounts. ‎Mobile verification is mandatory for participation in the satellite. ‎Satellite winnings are non-refundable / non-transferable. In case, a user wins multiple seats to ME or HR through Super & Regular Satellite and end up with an un-utilized ticket after the events, the same will be reimbursed in the Adda52 account after applicable tax deduction. If a user wins multiple tickets to the same through only regular satellites, the same will not be reimbursed. ‎The Tournament Director has the right to change table seating to accommodate player. His decision will be final. ‎All Satellite winners who come in the money will have to pay tax based on their Satellite Buy-in and/or rebuy-in amounts. ‎All additional prizes announced by Adda52 will be credited to your Adda52 Account. ‎Satellite winners will have to carry the Adda52 pass to participate in the event. ‎It would be mandatory for all satellite winners qualifying for DPT to wear Adda52.com merchandise (to be provided by Adda52.com) across the series. ‎By participating in the tournament, the players consent to providetheir image, interview etc., to be used as promotional content by Adda52.com and it’s media partners. ‎Adda52.com reserves the right to modify or withdraw the tournament at any time without prior notice. Adda52.com’s decision regarding the same shall be final and binding. ‎TDS applicable on all winnings above INR 10,000. ‎As a gesture towards our hard-working dealers/tournament staff, we will have 1% Gratuity which will be deducted from the total prize pool. ‎Surrogate marketing will not be allowed. Guests would be requested to leave if found indulging any such marketing.